Don't be lonely this Xmas! Come and have a sniff of Word Dog! Word Dogs have the bone730pm. At FRESSH - Cochrane Street, just off George Square, Glasgow. The Word Dog pack are out riding with the merchants this weekend. ONE Magazine is presenting the annual Merchant City Festival writing conference on the theme of the DECAY OF LYING. Saturday 26th September. 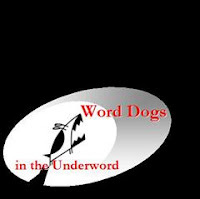 Word Dogs are on the scent 6-7pm. The day-long conference is from 10am to 7pm FRESSH - Cochrane Street, just off George Square, Glasgow. Martin Belk -- Co-founder of ONE Magazine, chronicler of New York, literary reviewer, director, Edinburgh Fringe producer, Writer in Residence at Polmont Young Offenders Institution. He has recently moved to The Gorbals to become a proper weegie. Hal Duncan - Author of the novels 'Vellum' and 'Ink' published by Macmillan, the latest novel 'Escape from Hell!!' is published by Monkeybrain books. Winner of various fantasy and SF literature prizes (including short listed for World Fantasy) and Vellum is currently on the shortlist for -- no less than -- the Prix Europeén Utopiales 2009. Mark Harding - Various publications and webzines. The next anthology where he has a story is 'OMG! The Book of Awesome Stuff!' Out soon. Ian Hunter -- Published in many many publications, including regular appearances in the New Writing Scotland and Dark Horizons anthologies. Has published three fantasy novels for children, the book 'Fantastic Glasgow' for adults, and is a founder member of 'Read Raw' new Scottish Writing collective. Alastair Sim -- His latest novel 'The Unbelievers' (a detective story set in Victorian Edinburgh) has just been published by Snowbooks. Phil Raines -- Stories regularly published in the best fantasy magazines. Stories with co-author Harvey Wells appear frequently in The Year's Best Fantasy And Horror anthologies. Come see the pack at Underword. Free! Word Dogs is a pack of literary talent based in Glasgow. Usually kennelled in the 13th Note, previous shows have included Urban Vertigo, Us And Them and The Invasion. The Hounds are following the trail to Edinburgh for the free Fringe. Bark worse than their bite? Come to Underword on Friday the 21st August and find out. Authors who have bared their teeth with the group include Hal Duncan, Neil Williamson, Phil Raines, Ian Hunter, Michael S. Collins, Duncan Lunan, Eliza Chan and Richard Mosses. Underword is a spoken word night for the Edinburgh Festival Fringe 2009. It runs 8th–29th August in Fingers Piano Bar, Frederick Street, from 7.50pm to 8.40pm. Admission is free. WHO CAN SUBMIT TO WORD DOGS? Anyone who can write and feels they can read what they write to an audience. It can be anything – poetry, prose, the only limitations are your imagination and the (very loosely fitting) theme of the night. BUT WHAT ABOUT ME? Sure. Give it a shot. Send us your best piece you feel fits in with the night. What have you go to lose? (Although, do try to make sure you can be in Glasgow on the night in question!) BUT I HAVE NO PRIOR WRITING CREDITS…. So what? Rome wasn’t built in a day. Talent always starts at one point. You think you have it – try us out. The worst we can do is say no (and even then, we’re rather nice about it). I DON’T LIVE IN GLASGOW. CAN I STILL SEND SUBMISSIONS IN? If you can attend the show, and can write, submissions are accepted from anyone.